The Exposition of Young Talents - The Leaders of Tomorrow! Professionalism is majesty! This statement proves very true to our IU Club students at Carmel School, who are trained by professional Speakers on Public Speaking and Leadership. 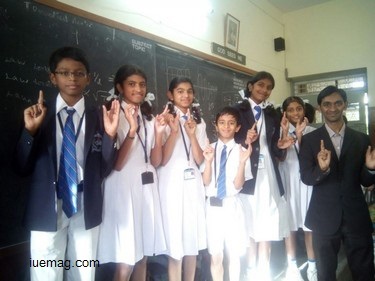 In today’s era where the young lads of our nation are in the averse of academics and curriculum they adjoin themselves into the rat race of marks and percentage and disconnect themselves from the reality and personal development, these set of students exemplify their living towards more beautiful journey by adapting professional speaking techniques at a very young age, and their interest in learning and practically implementing the techniques can leave any person- astound! Indeed, we are more delighted to share about the debating skills, for which the topics were given on the spot- their competitiveness, ability to frame a valuable content on the given topic, the body language that they exhibited and most importantly the confidence that they carried when they had to put across their points and views on the topic, would leave any person mesmerized as they do it more professionally than any trained and experienced speaker. The ‘WOW!! !’ Moment was not even the above explained things, the most terrific and awe-inspiring session was when they answered the questions from audience spontaneously with examples and utmost clarity! This is a true example of practical education and which most of us lack to learn, adapt and implement, were as the prevailing reality test us on all these parameters in every step of our life. We congratulate the best performers of the session whose abilities were par excellence- Gowri, Suvan, Disha, Divya, Jeevitha, Suhas! Our heartfelt thanks to Carmel High School, as they have adapted a culture of perfect education which is a combination of academics and personal development, which shall help every student to lead their life more confidently and meaningfully as they grow higher in their life, as it’s said that “words vocabuls the dreams”, the words that these children speak echoes the dreams that they shall live tomorrow!